Socially responsible investing, the practice of investing in products and services which demonstrate a company’s commitment to have a positive impact on environmental, social, and human rights issues, is a strong altruistic impulse in some Defined Contribution plan participants and not in others. Many may turn to their financial advisor or provider for expert advice on how to navigate the delicate balance of wanting to be socially responsible in their investments, but at the same time wanting to ensure their own financial success; others simply do not care. According to the US SIF Foundation’s 2014 Report on Sustainable and Responsible Investing Trends in the United States, as of year-end 2013, more than one out of every six dollars under professional management in the United States—$6.57 trillion or more—was invested according to SRI strategies. Overall, half (51 percent) of plan participants indicate that they do not have socially responsible investments in their portfolios, and 30 percent have up to 24 percent of their portfolio in these types of investments, according to Spectrem Group's research. Only 14 percent have between 25 percent-49 percent of their portfolio in socially responsible investments. 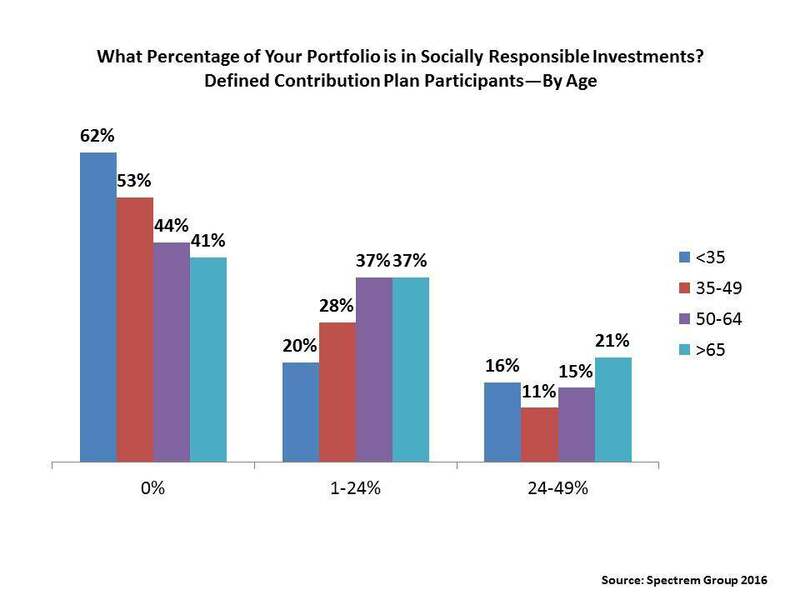 While the percentages are not large, Spectrem’s study finds that older DC plan participants are the most likely to have a significant portion of their investment portfolio invested in socially responsible investments. For example, of those who have earmarked 25 percent-49 percent of their portfolios to these investments, 21 percent are WWII generation households. Millennial plan participants comprise the largest percentage (62 percent) of those who have nothing invested in socially responsible investments. Analyzed by gender, the survey finds that female plan participants are more likely than males to have at least one-quarter to one half of their portfolio in socially responsible investments (18 percent vs. 10 percent). · It will create a better world for the less fortunate. · It will penalize and send a message to companies that create products deemed harmful. Other investors are much more pragmatic, with upwards of six-in-ten responses stating their investment objectives are purely financial. While just over 30 percent admit they have never given much thought to socially responsible investing, there are those who take a more cynical view and feel that most companies claiming “social responsibility” in their corporate behavior do so just for public relations. But as Spectrem research notes, the media message regarding social responsibility and global awareness becomes stronger each year and highlights the importance these issues will have to investors. The opening ceremonies of the Olympics in Rio featured a segment on climate change. It is up to advisors to position themselves as willing to help investors save the world while growing their assets. · Ask plan sponsors about their interest levels in socially responsible investments. Spectrem research finds that there are many who have not really given it much thought. They may have participants who are interested in these types of investments. Point out the different types of socially responsible investments. · Familiarize yourself with different types of socially responsible investments based on your client’s interests and priorities. Highlight socially responsible funds that may appeal to a larger number of participants. · Socially responsible investing could be a gateway to Millennial clients, who are stronger proponents of this type of investing. The seeds of working with them on sustainable and responsible investing may blossom into a working relationship for more of their financial and investment needs. · Be sure to educate participants about the pros and cons of socially responsible funds including investment return risk and comparisons to other funds.